Last week – while I was cleaning out our spare bedroom to get it set up as the nursery for baby number two – I came across a box of old DVDs. In among a pile that makes me strongly question the movie taste I had in university sat the box set of the complete 1972 Canada vs USSR Summit Series. During a week in mid-August, with the fun part of the offseason over and the season still almost two months away, it seemed that I had an itch that needed to be scratched. I wanted to watch some hockey. I’ve had enough summer analysis, I’m not ready for the pre-season predictions, and I just can’t bring myself to care about the World Cup of Hockey yet (if ever). I just felt like watching some games – yes, even in August. While watching, I began to reflect on what is widely regarded as the most pivotal time in Canadian hockey history. I started to wonder; is this really still significant to hockey fans? I decided to ask them. Here are my thoughts on the Summit Series – but more interestingly, I’ve asked for the perspective of others. Below mine, are the thoughts and perspectives from 14 people I respect immensely. From different walks of life and different parts of the continent – they were gracious enough to give their time to reflect on the series as well. It’s been more than a decade since I’ve last watched the Summit Series, and the hope was that I have a far greater nuanced analysis and appreciation for the hockey that is being played. At the very least, I now have a frame of reference to compare it to. I remember exactly where and with whom I watched Sidney Crosby score his golden goal at the 2010 Olympics. I’m 32-years old – an elder statesman for the Millennial generation – and for me, that Crosby goal is where my mind goes when I think of great Canadian hockey moments. I suspect it’s the same for most of my generation. For me, at least, the gravity of the Summit Series is lost a little. I understand the significance of the series from not just a hockey, but from a political perspective – but having watched the games with my dad years ago, it clearly doesn’t impact me the way it did him. Hockey fans my age have all heard the stories of school canceling class to watch the games on a grainy black and white TV in the gymnasium – but we weren’t around to experience it. Unfortunately, watching a series that took place 12 years before I was born simply doesn’t resonate the same way it would for those who lived it. For my generation, the great hockey moment is likely Crosby in Vancouver. For many Gen-Xers, that title often goes to the 1987 Canada Cup. In a 5-5 tie late in the third period, the two greatest forwards to ever play the game connected on one of the all-time great highlights. Gretzky to Lemieux, we’ve all seen the goal. As great as 1987 and 2010 were, though, I’d still wager that if you polled hockey fans in this country – particularly the older generations – 1972 and the Paul Henderson goal would still win out. Then there are my American friends. For them, the greatest hockey moment is the Miracle on Ice, and nothing else is even close. Like the Summit Series for us, the 1980 Olympics are engrained in the minds of American hockey fans whether they’ve seen the game against the Soviet Union or not (thanks a lot, Disney). Unlike in 1972, the Soviets were the favourite when they played the Americans – a powerhouse expected to trounce the young team made up mostly of college amateurs, on their way to an Olympic gold medal. For Americans, this is their moment. It defines the history of hockey for a country. Does anyone outside of the United States care about the Miracle on Ice? I don’t mean to sound callous, but no, probably not. Canadians may not want to believe it but if we’re being completely honest with ourselves, it’s likely the exact same way with the 1972 Summit Series. For so many, it defines hockey in Canada – and yet it matters very little, if at all, to hockey fans anywhere else in the world. When it comes to hockey, Canadians have an arrogance about the game and themselves. We proclaim to be the best and expect to win every single international tournament we participate in – it might not be flattering, but it’s true. Where did this arrogance come from? 1972. They’ve been called the Team of the Century by many in Canada. They’ve been called savage thugs by onlookers who can’t stand the way Bobby Clarke and others conducted themselves during the series. Canada could have lost, many believe they should have lost, but all we tend to remember is Paul Henderson’s goal and the fact that we won. Our best players won an 8-game series by the slimmest of margins – and yet it is recognized as possibly the biggest victory in the history of international hockey. It’s inspired countless books and documentaries. It turned an average NHLer into a legend and Hall of Famer thanks to one goal. It gave our country the confidence that hockey is our game and everyone else are just hangers-on. Don’t get me wrong – re-watching the series last week gave me a sense of nostalgia and pride. I loved watching the games, the shifts in momentum, the all-world skill and how deeply that series changed the way the game is played decades later. It may be blasphemous to say, but the Soviets played a speed and puck possession game that is far closer to what we see in the NHL today than Team Canada did. I don’t disregard the significance of 1972, nor do I wish for it to drift away. I just think that we should maybe look at it in a slightly different light than we have become accustomed to and remember that as time goes on and the game grows to heights never seen before, perspective may change. With that in mind, I’ve reached out to a number of people to get their perspective on the Summit series. Some close friends, some in the sports media whose work I admire and some who work within the game at varying capacities. Each was asked nothing more than to reflect on their own personal feelings towards the series. Below are their perspectives on 1972. Some positive, some negative but all opinions I greatly respect and I would like to thank everyone involved for contributing. Looking back on my childhood in Winnipeg, the mix of re-airings of the full series, the 100s of TV specials and interviews on it, and just hearing people talk about it have become a blur years later. I remember being in awe as a kid learning that my Uncle Roy and Cousin Jay were actually there, at one of the games (in Winnipeg). To me, that was the coolest link to the Series that made it “real”….that is, until a few months ago when our special advisor Pete Mahovlich walked into a scouting meeting wearing his 1972 Team Ring. I have a complicated relationship with the Summit Series. At different times I thought what Bobby Clarke did to Kharlamov was barbaric and the main reason Canada won. I’ve also said Crosby’s golden goal in 2010 is probably a bigger moment for Canadian hockey. Stepping outside of myself for the context of the time though, primarily the cold war, the Summit Series helped define Canadian hockey. We have a cocky view of ourselves when it comes to hockey in this country. A loss in 1972 probably would’ve been a big blow to Canada’s ego in the same way that victories in 1972 and 2010 left Canada buzzing for years. I come from a hybrid family – so I grew up in the United States, but my mom’s entire side of the family is from Scarborough. As a result, I’ve heard more Canadian hockey history than most Americans – and that’s worth prefacing a response with. That being said, though, I think people in America (at least, hockey fans) know that the Summit Series is important in Canadian hockey history in the same way that a Canadian, pre-Disney Miracle On Ice movie, would have known that the 1980 Olympics were important to American hockey history. They’d know it the same way that, say, a sports fan out in California might know about the Red Sox curse of the Bambino, or the same way that a diehard Texas football fan would be aware of the Cleveland curse; your level of understanding of it would almost directly relate to how much time you spent invested in detailed fandom, rather than casual interest in the game. I do think there’s an age qualifier on this as well. When you live through an event – even if it doesn’t pertain to your country particularly – you tend to know it more than you would if it happened predating your birth. The generations that were born after 1972, both in Canada and in the United States, would only know history through storytelling; in America, the likelihood of someone telling you that story goes down, so you’re less likely to know it as well. It was another generation’s triumph, won five years before I was born. As an experience, it was a bit like the moon landing, or Jimi Hendrix playing at Woodstock — something from an earlier time that impressed without really inspiring. What came to separate the Summit Series, in an odd kind of way, was the passage of more time. As I grew older — and grew vaguely more literate — what unfolded in 1972 accumulated more personal meaning with the benefit of context. It was a Canadian victory, sure, but it was also something more. It became a rare moment the whole country was able to share, to rally around. It was a shared cultural moment in a country that forever seems in search of some kind of cultural identity. That team seemed to embody what a number of Canadians wanted to see of themselves. And that feeling was still echoing off the landscape years later, as the next generation was just getting its first look at the grainy game film. I haven’t watched the whole series in a while, I want to say almost 10 years. I was born after the series took place so I never saw the games live. But growing up I was always interested in hockey history, so I had read a lot about the series. I think old time hockey gets mythologized a fair bit especially by older generations but I remember recalling how much “smoother” the Russians skated and how little actual hitting took place. From a fan perspective, I couldn’t help but think how great it would have been if Bobby Orr could have played in the series. In terms of hockey history, the series was huge but as we get further and further away, its significance has, and will continue to lessen. While far removed from the Bay of Pigs, the Cold War was still pretty much a thing in the ’70s and ’80s. Though Canada never really had the military might of the USA it was still seen as good versus evil. This was Canada’s little place in the Cold War. But in the end, the influence of the Soviets and how they played hockey ended up having a big impact on how the sport moved forward, despite the Broad Street Bullies era directly proceeding the series. Over time what I’ve found interesting is how attitudes towards hockey personalities have changed. When you read reports or writing around the Summit Series, it was always pointed out how the Canadians played with passion and emotion. In essence, that was playing the Canadian way. The Russians were criticized for being robot-like, showing absolutely no emotion while playing. Today, many of those journalists – and many influenced by those journalists – will praise players like Sidney Crosby and Jonathan Toews for being stoic and unfazed, while being critical of players like Alex Ovechkin and PK Subban for being too emotional on the ice. I’ve always found the shift intriguing. Of course, at the time, it was no doubt perfect drama: political tensions, an unknown opponent and a misinformed Canadian perspective that was quickly challenged and then shattered. And something to consider is what would have happened had we lost that tournament in ’72? Would we have held on so tightly to the style of play that defined Canadian hockey? Or would we have been quicker to consider the merits of the Soviet system? What does NHL hockey look like, moving forward, if the Soviets had won an incredibly close tournament that, if we’re honest, could have gone either way. To me, the 1972 Summit Series is like stubby beer bottles, Export A smokes in the green pack and wearing unlaced Kodiaks as winter boots. All things that defined an era. I did happen to watch the whole thing, but only 15 years after it took place. My father always spoke about the series as if it was some mythical event, recalling every detail with intense accuracy. He tried explaining what it meant to the country at the time, but until I saw it for myself I never really understood. In a sense, it was a rite of passage for a young hockey fan. My father wanted me to know the importance of the event, and how it went beyond hockey. In a time of unrest, it brought pride to a country, and above all that is probably the lasting effect we see to this day. He also maintained that Paul Henderson is overrated, and Tretiak was woefully underestimated by Canada’s scouts, but that’s a whole other issue. It is well over 40 years since the 1972 Series and my memories are still very strong. My Dad and I spent the summer talking about the series, getting information on the Russian team (we were told they had no good goalies!) and generally being supremely confident about Canada’s chances. I watched every minute and read every available story. I recall Serge Savard being brilliant, Bill White incredibly effective, Vic Hadfield going home, Ken Dryden struggling against the Russians who choose pass over shoot beyond reason. I remember Cournoyer scoring to tie, and feeling chills, and I remember Henderson scoring and a nation raising its hands in glory. Among the shared experiences I have had with my fellow Canadians, only the incredible story and infinitely sad death of Terry Fox can compare. As an American living far from the border and with no Canadian relatives, I never heard of the ’72 Summit Series until I became a sports reporter. It never entirely made sense to me: If these two nations were bitter enough enemies that a hockey series between them could double as a geopolitical showdown, how did they manage to arrange the series in the first place? While the Miracle on Ice came during the Olympics, where nations traditionally put grudges on hold for the sake of sports; the Summit Series was an act of cooperation, which creates a bit of a disconnect for me in the larger Cold War context. Aside from that, my main impression of ’72 is that Flin Flon must be a dreadful place if Bobby Clarke was willing to break a guy’s ankle just to escape it. This might be the one sporting event I wish I was fully engaged in as a kid or teenager that I wasn’t — I was a year old in August 1972. Though the 1987 Canada Cup was my generation’s 1972, it still didn’t have the political intrigue at the time, the mystery of how good the Soviets would be – by 1987 we may have even been overrating them, if that was possible, and thinking they all could step in and dominate in the NHL. Watching that Game 1 on the DVD and seeing the Soviets utterly toy with an incredible generation of Canadian players is just beyond stunning. It’s difficult to distinguish the more shocking development — the ease with which Soviet forwards like Valeri Kharlamov or Vladimir Petrov could score, or the fact that it was every single Canadian citizen’s first genuine look at Vladislav Tretiak, in goal, and that he was every bit the equal for Ken Dryden, and even better on some nights. What I’ve always wondered is how international hockey changes if the Soviets had continued the punking of our best and not lost the three straight on a very intimidating home ice to lose the series. Of course, there’s no heroic moment for Paul Henderson and the Canadian team, but maybe there’s even more vitriol and negativity towards the Russians when they came to play at the Super Series in 1975-76 — a series of games I do remember, and have DVD versions of both the New Year’s Eve Canadiens classic, and the Flyers’ violent 4-1 romp on that snowy Sunday afternoon in early 1976. The Series worked out perfectly though, in a manner in which many sporting moments just cannot deliver. If Canada wins seven of the eight games, maybe there isn’t the urgency to start a tournament like the Canada Cup in the fall of 1976. If the Russians win the series handily, maybe NHL teams are seeking potential defectors far earlier from Communist nations, as they did in the late 1970s and early 1980s. As a somewhat newer hockey fan, I didn’t start watching until high school – and as a result, the 1972 summit series was something I had no clue existed until about a year a two ago, with the release of several documentaries like Of Miracles and Men, Red Army, and an NBCSN doc on it as well. For American hockey fans, I just don’t see it as making that much of an impact on the culture here in the United States (other than being just a cool piece of the sports history that can be used as a useless bit of info to seem smarter at a bar somewhere). The most interesting part of the summit series for me, other than the image of JP Parise nearly attacking a referee with his stick, is how it played into the narrative of the Soviet hockey team in the years leading up to the miracle on ice as the USSR being the best team in the world – with the summit series proving that. I am 50 years old. So that means I was 6 when the Summit Series was going on. So I have no memories of watching it live. However, since then, I have watched the games numerous times. I have books and columns on the series. I have watched countless documentaries and interviews from players on Team Canada and the USSR. A few years ago I was taking part in the annual fundraiser, the Road Hockey to Conquer Cancer. The keynote speaker was noted cancer survivor and the hero of 1972 Summit series, Paul Henderson. The standing ovation he received when he was introduced sent chills up my spine. I understand the passion Canadians have for the heroes of the 1972 Summit series. Back then, they really were known as the “Big Bad Russians”. My father was in the RCAF at the time and the possibility of global war with the USSR was a reality we lived with all the time. For many, this really was “war” on ice. It was our style of hockey and our style of living (democracy) versus their style of hockey and their style of living (Communism). Even though I devoured the series after the fact, the images and sounds (Henderson!) are forever burned into my brain. My favourite International Canadian hockey moment is the 1987 Canada Cup. But as great as that was, it wasn’t the first. 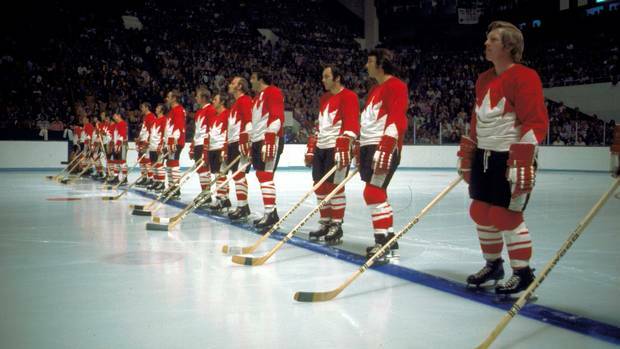 The 1972 Summit Series has that claim and that’s why the memories of those games will live on forever. The funny thing is that although I never watched the summit series live, I feel like I have memories from it because of how significant of a series it was. What I know is essentially what others remember as most of my knowledge of the series comes from what was passed down to me by people like my father who watched the series live. I was born 22 years after the summit series – to put that into perspective I just turned 22 last weeks’. Despite this, I know all about the Soviet legends like Kharlamov and Tretiak making their stamp in the North American hockey world, the Bobby Clarke chop, the Bobby Hull incident, and most importantly the entire role the cold war played in elevating the series beyond hockey. Have I watched the 1972 Summit Series: Yeah, absolutely. I’m sure I’ve watched it all the way through more than once, too. My father was big into the mythology of the tournament. What it meant for Canada at the time and himself personally. Of course, it didn’t hurt that ‘Fireworks’ by The Tragically Hip was playing almost constantly on the radio from the time I was about five onward. You could say I had the opportunity not only to watch the series, but hear it in song too. It hasn’t had that large of an impact on me, personally. It brings up some nostalgia from my childhood, sure. Beyond that, it hasn’t impacted my life in all that meaningful a way. The hockey was fantastic and it’s interesting to check out the stylistic changes that have been made to the game since, but nothing earth shattering, no. Check out Part 2 with ten more great contributions here. Kudos for writing this post, especially given that for many people they did not witness the historic series live, but some years or decades later. I was just a teenager at the time, but remember clearly as a portable TV stand was wheeled into our classroom and watching one of the games live on an old Black & White TV. Kids crammed into the classroom, many sitting on the floor, or standing along the walls. Best day of school ever! As we get older (and believe me, everyone will), our perspective and appreciation for the game of hockey and those in the game changes. We’ve seen how the game has changed in our lifetime and watched some great players in all stages of their careers. If you get in a conversation with fans or media about a player of any given era, the perspectives can be so different. Ask a kid who is the greatest forward, or defenceman, or goalie he/she has seen play. They only have a limited number of years as reference, unless they’ve taken the time to go back and watch countless number of archived games. The same can be said for those in their 20’s, 30’s, 40’s etc etc. Jean Beliveau, Gordie Howe and other greats have passed on in recent years. Most fans know them as hockey legends, and as great embassaders of the game, but probably never saw a complete game they played in their prime. Ask those in their 70’s, 80’s and 90’s, about who were the great players and you’ll get an education. My father-in-law often said Doug Harvey was the best defenceman he ever saw play. If you’re my age, you can’t imagine anyone better than Bobby Orr, and have no appreciation of how good Harvey was, or how he’d compare. Same with those who never saw Orr play, they might say someone like Doughty or Karlsson is the greatest. The 72 Summit Series was a huge deal at the time, as it finally pitted some of the best “professional” NHL players (in our case from Canada) against the so-called “non-professional” powerhouse of international hockey. Everyone anticipated that Canada was going to win in a land-slide, but we all know what unfolded. That series, as well as the gradual influx of players from Europe, forced the NHL to evolve. European players were proven overall to be faster, more fit, better puck handlers, and playing a cycling-possession game. The 72 series, as well as the players coming over from Russia and other countries, made it clear that “our game” needed big changes at all levels. Catching up was the challenge. Equipment has changed, training/fitness has changed, coaching has changed, development has changed, scouting has changed. It is unfair to go back and compare from different eras, or to truly appreciate the game or the players of that time. Can you compare the Canada Cup goal, to Henderson’s goal in dying minutes of the Summit Series, to Sid’s Golden Goal? You can say they were each great moments, but how significant they were is dependent on your perspective at the time, and today.